Many observers are aware that the US has the worst income inequality in the world among the more developed high income countries. But conservatives have attributed this to inequality resulting from what they see as a dynamic market based economy, that rewards entrepreneurs generously for hard work and taking risks. Government interventions that have sought to compensate for the resulting inequality are seen by these conservatives as ineffective and misguided, and indeed counterproductive. Thus on the 50th anniversary last week of President Lyndon Johnson declaring a “War on Poverty”, conservatives such as Senator Marco Rubio have asserted that those efforts were a failure, and that we should scale back, and even defund and dismantle, government social programs which have sought to alleviate the conditions of the poor. They assert “big government” is the problem, and small government the solution. But the premises on which these criticisms are based are faulty. Individual anti-poverty programs have in fact worked quite well and poverty rates have come down – see this reference for example. But more fundamentally, one needs to start with the recognition that the US market system does not itself produce greater inequality or higher poverty rates than elsewhere. For this, US rates are similar to those for others, as will be seen below. Where the US differs, however, is in the inequality and poverty rates after one includes the impact of government via taxes and transfer programs, to arrive at what individuals are in fact able to buy and consume. Such government interventions have reduced inequality and poverty rates in all countries. But because the US efforts are so much more limited than they are elsewhere, US inequality and poverty rates are the worst in the world once one takes these into account. And since a person’s living standard depends on what they are able to buy after taking into account taxes and transfer programs (such as Social Security or unemployment compensation), it is the latter which matters. Thus the assertion from Senator Rubio and others that government efforts to reduce inequality and poverty have failed (since we still have inequality and poverty), and that they therefore should be cut back or eliminated altogether, is misguided. Government interventions through tax and transfer programs have reduced inequality and poverty, but they have done so less in the US than elsewhere because their scale in the US is more limited than elsewhere. It is due to this limited scale that the US ends up being ranked as the worst in the world among other high income countries in terms of inequality and poverty. This blog post will review these issues, drawing mostly on data available from the OECD Statistics web site. We will first focus on the inequality measure called the Gini coefficient, both before and then after taxes and transfers. The Gini is probably the most widely used measure of inequality (when there is any measure of inequality available, which is not always the case as one needs large and expensive household sample surveys). It varies from zero to one, with a value of zero indicating perfect equality of incomes (all individuals, or households, in the country earn the same amount), and a value of one indicating complete inequality (all of the nation’s income accrues to one person). The section of the blog post that then follows will then look at poverty head counts – both before and then after taxes and transfers. The chart at the top of this blog post shows the Gini coefficient for the US and a set of comparable high income countries (mostly from Western Europe, along with Canada, Japan, Australia, and New Zealand). Based just on incomes as earned in the market, inequality in the US is in the middle of the range found for the other countries – a bit worse than the average but not by much. Inequality of market incomes was worse in Ireland, the UK, Portugal, Spain, France, and Italy. There is no sign here that the US economic structure leads to a distribution of income that is worse than that seen elsewhere among the high income developed countries of the world. The picture changes markedly once one takes into account the impact of taxes and government transfer programs. This is shown on the second chart above. Inequality then falls in all of the countries, as there is at least some degree of progressivity in the tax systems, and government transfer programs are also and more markedly progressive. Even if the benefits of some transfer program are distributed in equal dollar amounts to all in the population, that level of transfer will be of greater relative importance to a poor person than to a rich person. Inequality as measured by the Gini coefficient is reduced in each of the countries once one takes into account taxes and transfers. The reductions are indeed quite significant. But the reduction in the US is smaller than in any other country, and the result is that the US then ranks worst in terms of inequality once one takes into account taxes and transfers. An interesting question is whether the reductions in inequality are primarily due to the tax system, or to transfer programs. Tax systems and transfer programs are both in general progressive. That is, tax rates are generally higher for those individuals with higher income, and transfer programs are generally designed to benefit the poor more than the rich. But not all individual tax and transfer programs are progressive. Flat consumption taxes, such as sales taxes in the US and value-added taxes in Europe, can be regressive, in that they take a higher share from the poor (who must consume almost all of their limited income) than the rich. The scale of the programs also matter. One might have an extremely progressive tax structure, for example, but if the size is small (so that little is collected in taxes) then it will have little impact on inequality. One therefore needs to look at the data. While the standard OECD files used for the above do not have this, an analysis posted as the Budget Incidence Fiscal Redistribution Database by the research center known as the Luxembourg Income Study (based in Luxembourg and with a US office at the City University of New York), does provide such a breakdown. The analysis was prepared by Chen Wang and Koen Caminada of the University of Leiden in the Netherlands, and a description is available in this working paper. 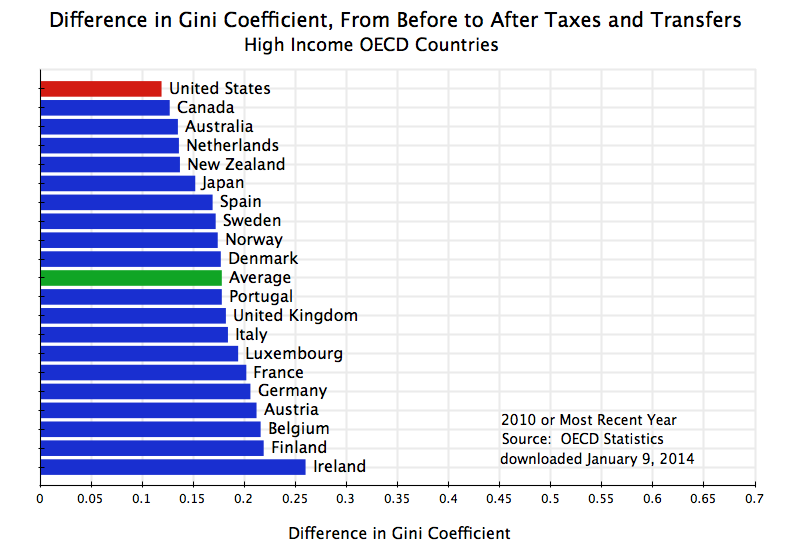 The first two columns show the Gini coefficient, first before and then after taxes and transfers. The third column then shows the change in the Gini, with the countries in the table ranked according to this change (from smallest to largest). While the specific numbers differ from those in the OECD data shown above (the year is different, plus the data may be drawn from different underlying sources), the two are broadly consistent. 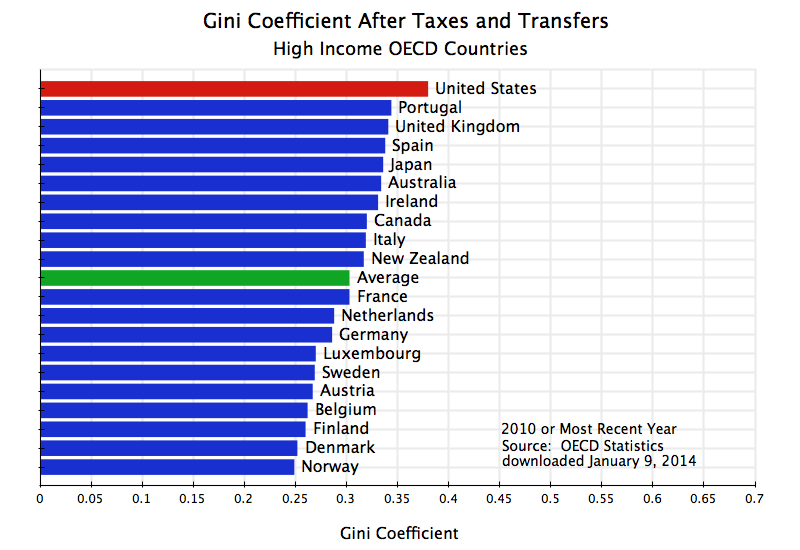 In both sets, the US ranks as the most unequal in terms of income after taxes and transfers, with the change in the Gini from before to after also the smallest. 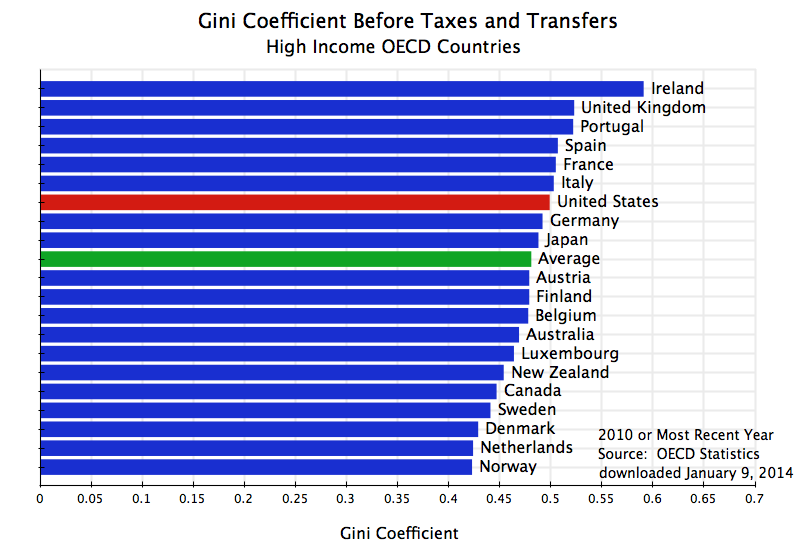 Before taxes and transfers, the Gini for the US is within the range seen for the other countries, with Italy, the UK, Ireland, and Germany all worse. The authors decompose the change in the Gini according to how much is due to the tax system and how much is due to government transfer programs. For the US, for example, the total reduction in the Gini was 0.109 points, with 0.043 coming from the tax system and 0.066 coming from the impact of government transfers. The reduction in the Gini in the US due to the impact of the tax system (of 0.043 points) is within the range seen for the other countries and is indeed even somewhat higher than the average impact across all countries (of 0.031 points). The US relies mainly on direct income taxes for raising tax revenue, while European countries rely more on value-added taxes. Income taxes with progressive rates will have a greater impact on reducing inequality than will value-added taxes. But there are other taxes in all countries, including income taxes in Europe. More importantly, Europe collects far more in tax revenues than the US does, and hence even if the US tax system has more progressive rates overall, the larger scale in Europe means there can be more of an impact on inequality there. Based on OECD tax data, the US collected (at all levels of government) just 24% of GDP in tax revenue in 2012, while Western Europe on average collected over 60% more at 39% of GDP. But more important than the impact of the tax system on inequality was the impact of government transfer programs. Transfer programs in the US did reduce inequality as measured by the Gini by 0.066 points. But this was the smallest of any of the countries. It was less than half the average reduction across all the countries of 0.136 points, and an even smaller share relative to the average for just the European countries of 0.148 points. The reduction was larger in Europe than in the US primarily because the transfer programs were larger in Europe than in the US. The final column in the table shows the average level of transfers in each country relative to household incomes. This was just 9.9% in the US, which was about half of the 19.6% for all the countries, and well less than half of the 21.5% average for just the European countries. Transfer programs do bring down inequality, and does this in all countries including the US. 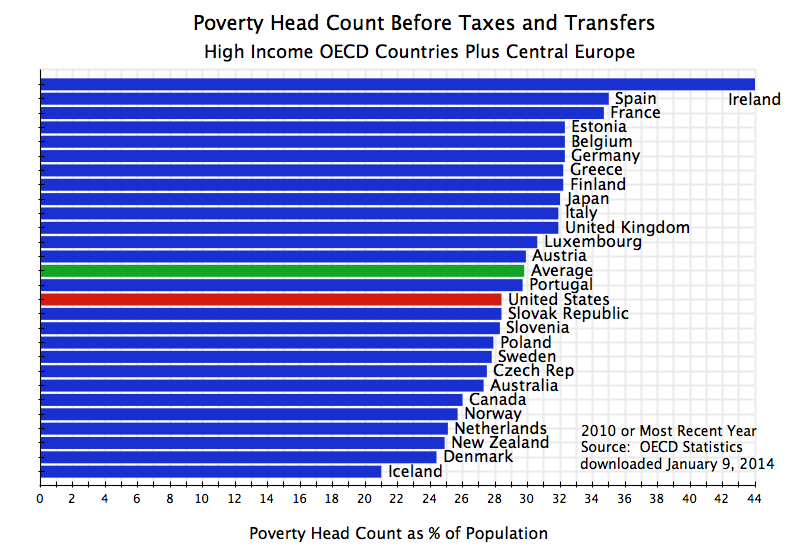 But government transfer programs are so much more limited in the US than elsewhere that the US ends up as the worst in the world in inequality once one accounts for them along with taxes. The discussion above was on inequality, using the Gini coefficient as the measure. But inequality (and the Gini measure), cover the entire income range from rich to poor. One might also reasonably want to know how the US compares when one focuses exclusively on the poor. What share of the population is poor, where does the US rank by this measure compared to other countries, and again what is the impact of taxes and transfers? We will find that the results are basically the same as that found above for the Gini. 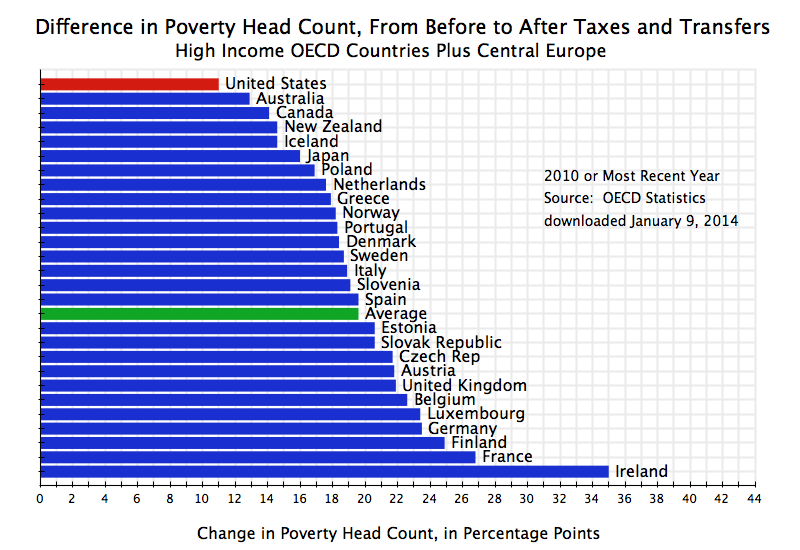 A direct measure of the poverty rate is available from the same OECD data base utilized above for the Gini. The concept used is the share of the population (the head count) with incomes below a poverty line defined as 50% of the median income in the country. This is a relative measure that takes into account that the standard used for determining who is poor should depend on how rich the country is. 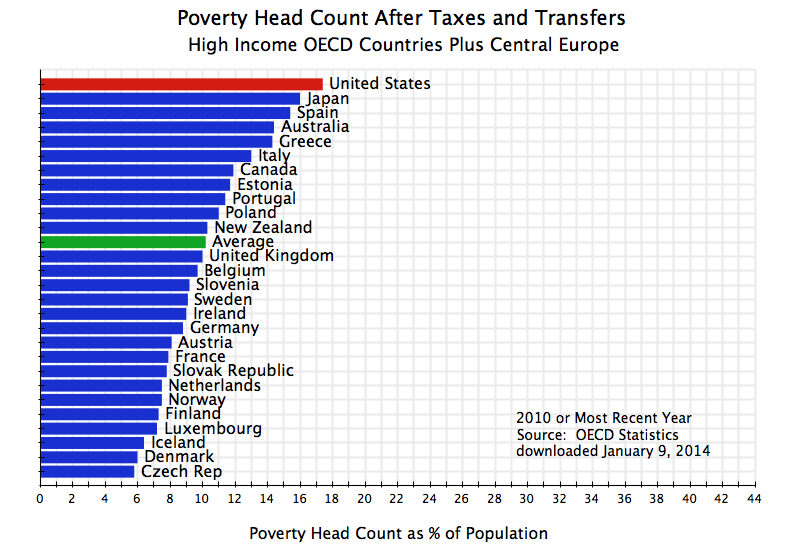 Due to the limited scale of such government programs in the US, poverty rates end up higher in the US than in any other high income OECD country. Many presume that the US has high inequality and poverty rates because of the market economy system in the US. While it may be recognized that inequality in the US is higher than elsewhere, and poverty rates also higher, the presumption is that these are unfortunate byproducts of a market system that rewards hard work and risk taking. But this is not the case. Inequality and poverty in the US is similar to that found elsewhere among the high income OECD countries, when one takes incomes as determined before accounting for taxes paid and the impact of government transfer programs. The US is indeed quite close to the average seen elsewhere for these market determined incomes. Where the US differs, however, is in inequality and poverty rates after one takes into account taxes paid and transfers received. And since this determines what individuals are in fact able to buy and consume, these incomes after taxes and transfers determine actual living standards. Once one takes into account taxes and transfers, the US moves from the middle of the range to the worst ranking country. The tax systems and transfer programs reduce inequality and poverty rates in all countries, including the US. But the US programs are so much more limited than those found elsewhere, particularly in Europe, that the rest of the OECD world reaches and surpasses the US by these measures. Inequality and poverty rates in the US, as the worst in the world after accounting for taxes and transfers, are not therefore a consequence of failed government programs, which conservatives such as Senator Rubio want to cut by even more. Rather, the ranking of the US as the worst in the world is a consequence of the opposite: that these programs are too small and limited. This entry was posted in Distribution of Income and tagged entitlements, government spending, income distribution, policy, poverty by aneconomicsense. Bookmark the permalink.